One of the most dreaded moments in every laptop owner’s life is seeing a “low battery” warning when you’re far away from a charger and are not about to get home anytime soon. That’s what makes solar chargers so exciting because they allow you to recharge your laptop or smartphone whenever, wherever. Now you can camp under the stars, go on lengthy hiking excursions and enjoy yourself without worrying about not having a power source to charge your portable devices. The great thing about solar chargers is that they’re fully portable and all they need is exposure to the sun and you’ll never have to panic when you see that “low battery” notification again. How Does a Solar Laptop Charger Work? First off, there are different types of solar chargers out there to suit different purposes. However, most of them usually come as a kit that includes various plugs and adapters to fit different devices, from smartphones and tablets to laptops. Some are designed as solar laptop chargers that come complete with a battery pack from which you get to charge your laptop. Then, there are chargers that allow you to draw power directly from the solar panel using your laptop’s charger adapter. The option you go with will depend on your specific situation and the conditions you’ll be using it for, so you’ll need to keep that in mind when you start shopping around. As with any purchase, there are certain factors that you have to keep in mind when shopping for a solar laptop charger. We’ve gone ahead and listed some of the most important aspects to help make the buying process easier for you. Solar laptop chargers typically have wattage of about 5 to 21 watts on average. You can pretty much tell the wattage of the charger by looking at the size of its solar panels. The larger the solar panels are, the higher the wattage. However, even the large ones aren’t so large that you can’t carry them around, especially if you’re driving or on a boat. However, if you’re planning on taking your charger with you on a long mountain climbing excursion or a trip where you’ll be carrying everything on your back, then a smaller charger will probably be a good idea. You also have to consider the charger’s surface area, because it’s a good indication of its charging capacity, performance and how efficient it will be at charging your laptop. Most of the solar laptop chargers that you’ll come across don’t come with a battery pack, and the ones that do may not be compatible with your laptop adapter. Either way, always look at the features of the solar charger itself and not whether or not it comes with a battery pack, because you can always make up for that by purchasing an external battery. One of the things you obviously want to know about your solar laptop charger is how long it’ll take to charge your laptop. After all, you don’t want to wait for the whole day just to get one full charge. However, it’s important to also keep in mind that there are various circumstances that can affect this performance indicator, from the type of adaptor and battery in question to the weather conditions as well. That’s why most solar charger manufacturers don’t really specify how long their chargers take to recharge a battery. One way to find out though is by reading past customer reviews to find out what their experiences have been with the charger and you’re bound to notice a pattern that either shows the charger is fast or slow. Solar chargers work according to a very systematic approach. First, there’s an electrical current that comes from the solar panels and runs through the wires. This current is measured in amps, and in order to get this measurement, you have to divide the voltage produced by the amount of resistance offered. Meanwhile, the solar charger’s wattage is measured by multiplying the voltage by the current. The more output power your charger has, the more devices you’ll be able to use it for. To find out what the output power is in your charger, simply test them one by one. Solar panels are generally made from three main materials, including CIGS, which is a combination of copper, selenide, gallium and indium, as well as Monocrystalline. Now, while CIGS is the cheaper option, its chargers don’t tend to last that long. On the other hand, Monocrystalline is the stuff they use to make old solar panels and it’s not only rugged and durable, but it can last for a very long time too. The only hitch is that it doesn’t work really well in low-light conditions. Meanwhile, modern manufacturers mostly use polycrystalline, which is a rather pricey material but it definitely does the job. And it’s much more efficient when compared to the other two materials. The solar laptop charger is a real game changer because it gives you power when you need it the most. You can literally carry it anywhere and as long as there’s sun, you’ll never have to worry about running out of battery power, regardless of where you are. 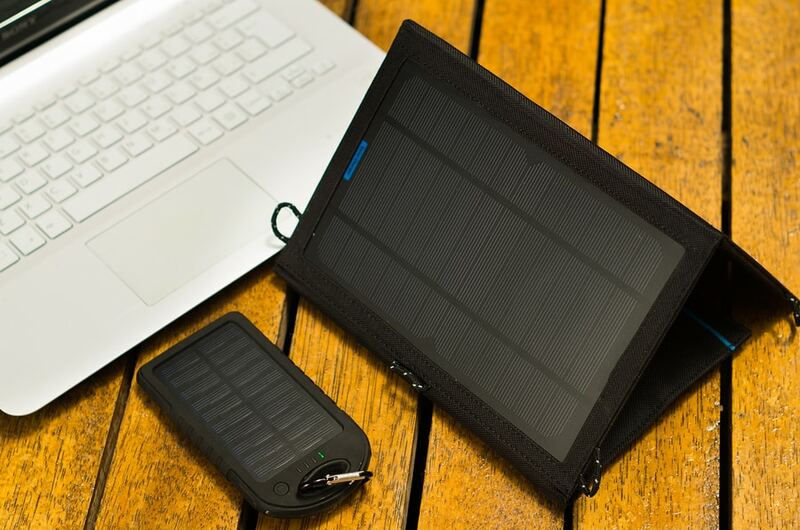 To help you get the best charger to suit your needs, we’ve compiled a list of the best solar laptop chargers available on the market right now. Huge Capacity: 24000mAh rechargeable Li-polymer battery equipped with 3 large solar panels,compatible with all the phone models,which could charge iPhone 6/7 for 10 times,Galaxy S6 for 6 times.iPhone 7 for 9 times, Samsung S7 for 5.5 times, ipad Air for 3+ times. 3 Solar panels: When you're outdoors, 3 solar panels can absorb more sun power,which makes its charging speed to 20-26hours,It improve the conversion rate of the solar panel greatly in that case.shortens the solar charging time. Folding design Provides Extra Flexibility. Convenient to Carry in Your Bag for Daily Use and for Travelling. Multi-Protect Safety: Rugged design, Rain-splashy, Shock-proof, Dust-proof.Intelligent Protection System effectively prevents your devices from overcharge, overcurrent and short circuits as well as conform to CE, RoHS, and FCC specifications. Dual USB & Powerful LED Light: Dual 2.1A USB allow you to fast charge two devices at the same time, work with all iphone/iPad/Tablets, or other cellphones and electronic devices,the powerful LED light can be used as flashlight with Steady -SOS-Strobe mode, Perfect for outside activity or emergency use. What You Get: WBPINE 24000 Portable Solar Phone Charger with Exquisite Packing, 1pcs micro USB cable, User Manual, Carabiner; 18-Months Warranty - Friendly Customer Service. 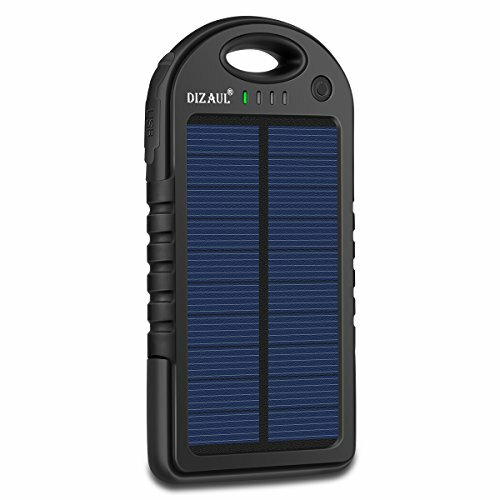 Rugged and effective, this solar power bank has it all. It features two USB 2.1A inputs so that you can simultaneously charge two devices at once, it’s compatible with Android and Apple smartphones, as well as many other devices, and it’s backed by a whopping 24,000 mAh battery pack. It absorbs power from the sun using three fold-out solar panels, and thanks to the attached hook, you can hang it in your tent or on your backpack so that it recharges while you’re on the move. It usually finishes recharging in less than 26 minutes. The best part is that it’s made from tough-wearing, long-lasting and weather-resistant materials that feature intelligent technology to ensure that your devices don’t ever overheat or overcharge. 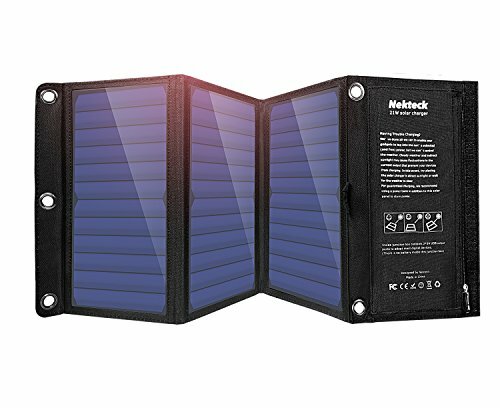 The Neckteck is a small but powerful solar laptop charger, with the ability to take on any terrain, thanks to its rugged and thoughtful design. It features two USB ports suitable for both Android and Apple devices and it has a built-in smart IC chip that enables it to automatically detect the type and make of the device that’s plugged in. This helps to prevent under or overcharging. Weighing just 18 ounces with folded dimensions of 6.3 x 11.1 x 1.96 inches, this solar charger is compact and perfect for use when you’re on the go hiking, camping or fishing. This solar laptop charger from Aukey is made from lightweight yet scratch, water, and weather-resistant PVC fabric, with PET laminated solar panels to boot! It’s super light and easy to carry, as it weighs just 2.1 pounds and when you fold it up it measures only 1.8 inches thick. You can tell from the design that this charger was made for outdoor use. The solar panels alone reportedly deliver 28 watts of power at 2.4 amps per port and are 23.5% more efficient overall. There are two USB ports so you can charge two devices at once, and it features four carabiners so you can hook it up to your tent, backpack or car while you go about your business exploring the wilderness. No built-in battery. 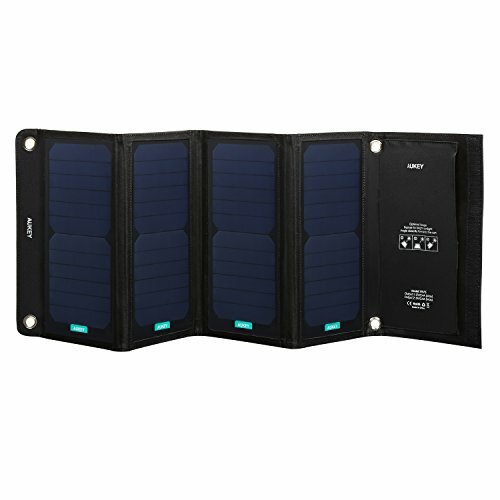 What You Get: SOKOO FSC-22 22W 2-Port USB Folding Solar Charger, user manual, 2 attachment hooks, our 18-month warranty and friendly customer service. If you’re looking for a solar charger to take with you on an exceptionally long trip into the great outdoors, then this charger could be it. This SOKOO charger is made from weatherproof and water-resistant materials and is covered with PVC fabric for added protection. It offers 22-watt power and has a Smart IC circuit that enables it to provide just the right amount of power for each type of battery that you plug in, and it features two USB ports for you to plug in more than one device at once. At just 17.5-ounces, it’s lightweight and compact too and has dimensions of 12.2 x 6.69-inches when you unfold it. You’ll also be glad to know that this solar laptop charger has a max charge of 2.4A on the 5V port and 3.3A in the other one, and has a dedicated attachment hook that allows you to hook it up anywhere while you go out and do your thing. 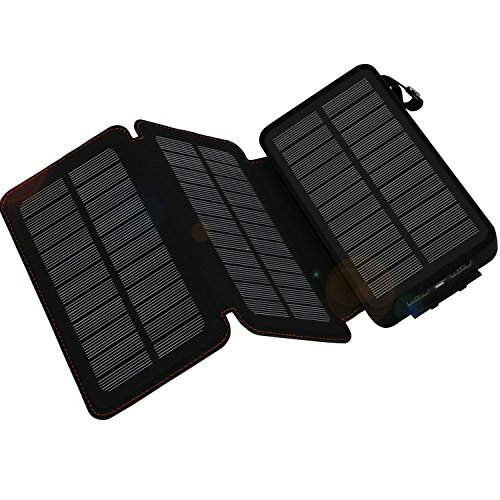 This Wildtek portable solar laptop charger is perfect for when you want a quick recharge for your devices. It’s made with super-efficient solar cells that shorten normal charging time by up to 50%, and the built-in stand is designed to help you place the charger in a way that allows for optimal sun energy absorption. Carrying this around is super easy, thanks to the featured, and it has dual USB ports that are suitable for several types of devices. It weighs only 2.1 pounds, has dimensions of 6.6 x 12.4 x 2.2 inches and easily folds when you’re done charging so you can pack it neatly into your backpack again. The best part about this charger is that it’s rugged, waterproof and dust-proof. What more could you ask for? 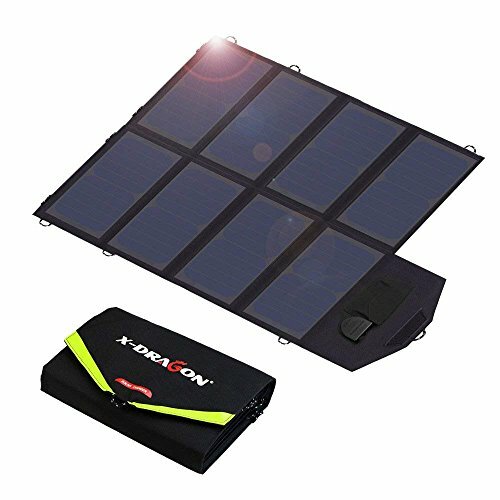 Charge several smartphone and tablet devices as well as laptops with this incredibly powerful solar charger from X-dragon. As always, this brand doesn’t disappoint, as this charger boasts 40watts with 2.8 amps of power. It also features a 5V/2A charging port, 18V DC output for your laptop, and 10-in-1 connector cables to charge all your devices with ease. Despite its powerful performance and many features, this charger is still lightweight and easy to carry, featuring a slim profile when folded. Plus thanks to the addition of SolarIQ technology, it delivers the appropriate amount of power for each device to avoid overcharging. The built-in carabiner means that you can just hook it onto your bag and let it absorb the sun’s energy while you hike, and its rugged ABS exterior coating means that you won’t have to worry about dust or water affecting it. HIGH CAPACITY -- 16750 mAh power bank equipped with a compact solar panel. The solar charging function will bring you a slim chance of survival once in power shortage. DUAL SOLAR CHARGER USB PORT -- Dual output USB Ports are enabled to transmit power to 2 devices simultaneously, portable cell phone charger, a great travel backup battery. BRIGHT LED LIGHT -- 2 built-in LED torch, lighten your night when going for an outdoor camping, 4 LED indicator lights that show at any time the control power. SPECIFICALLY DESIGNED FOR OUTDOOR CAMPING -- The portable solar charger's shell is made outdoor wear-resistant plastic,waterproof, shockproof, dustproof and metal hook for hands-free or hang it on backpack wherever you go. 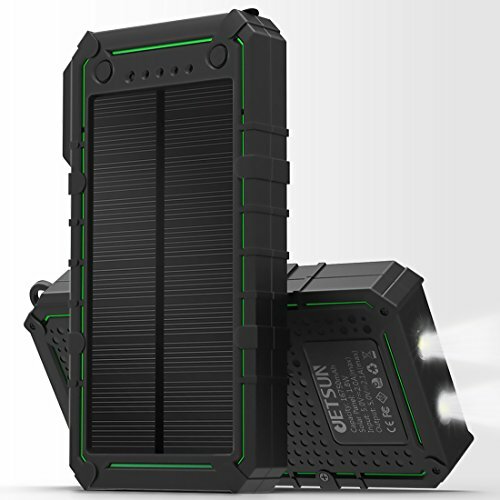 This solar charger power bank from Jetsun is the fastest of the lot, with the ability to recharge itself in 8 to 10 hours max, while it can fully recharge laptops and smartphones in as fast as two hours. The secret behind its power lies in its construction and features, which include a compact yet efficient solar panel, a 16,750mAh battery and dual USB ports to charge more than one device. While the built-in LED lights are designed to indicate the charging stage the charger is in, they also come in handy as a night light when you’re out in the woods. 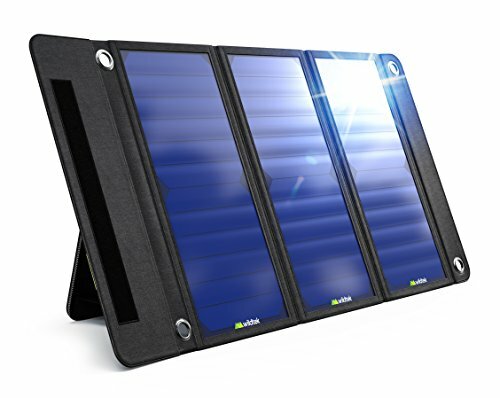 This durable solar laptop charger is constructed from water-dust and shockproof plastic which also happens to be wear resistant and it’s built to last. 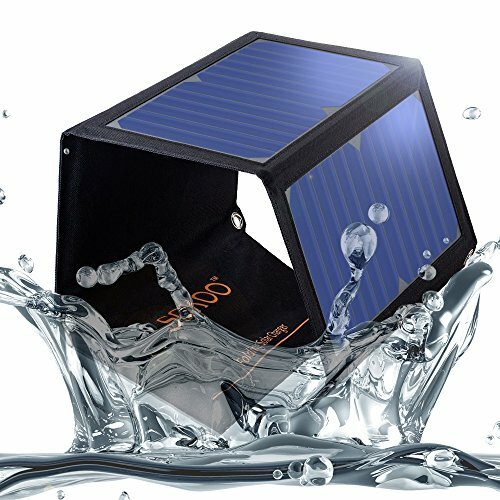 Compact and mobile with 5000mAh worth of power, this portable solar bank is very well-made, with a durable shell that makes it water-resistant and shockproof. It allows you to power up two devices at once, due to the dual USB ports, while the built-in hook means that you can just attach it onto the exterior of your backpack to make room for more of your stuff. Apart from the smart LED indicators that keep you informed about the battery’s power status, there’s an emergency flashlight included for you to use when you need a bit of extra light at night. The charging speed on this is lightning fast, as laptops can get a full charge in just two hours and it offers about 7 hours of AC charging time. However, the solar panel itself takes about two days to fully recharge due to its small size, but this is a small price to pay for the portable size of this thing, as it measures just 2.76 x 5.59 x .55 inches. Solar panel laptop chargers are all the rage right now, and for a good reason. They’re an exciting invention that enables you to stay connected with your devices even when you’re out in the wild. Gone are the days when you had to be close to an indoor electric outlet before you could recharge your laptop. With the right solar panel charger, you can spend days, weeks or even months “away from civilization” and still be able to keep your devices fully charged at all times (granted there’s enough sunlight that is). Based on the above list of reviewed solar chargers, we were most impressed by the size, performance, and power of the SOKOO 22W Solar Charger. Not only is this solar charger rugged, weatherproof and highly portable, but it’s also quick to recharge and has two USB charging ports for you to choose from.